Simply extract the zip file to a folder of your choice and start “Mumbai.exe”. You can safely extract the files from the zip archive to your existing Mumbai folder and overwrite the existing files (configuration files are kept). Any custom command that you set up on the toolbar will be gone. If you use a master password to encrypt connection passwords, you will loose all your stored passwords with this release. To prevent this, run your current version first and remove the master password, before updating to this version. Breaking change: -If you use a master password to encrypt connection passwords, you will loose all your stored passwords with this release. To prevent this, run your current version first and remove the master password, before updating to this version. 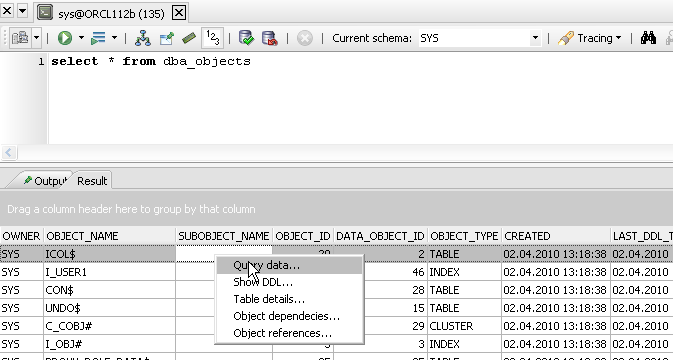 There is now a context sensitive help (F1) on V$*, DBA_* views and database parameters that links into the Oracle Referece manual. The necessary files for Oracle 10-12 will be downloaded the first time you access the help feature. Bug: Please see this comment on how to workaround this problem. 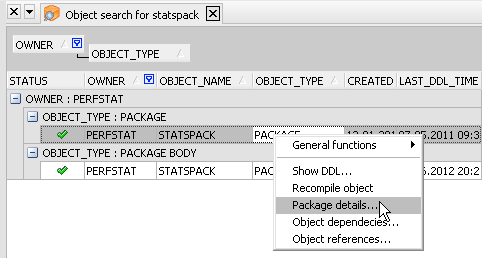 Package detail view: A view which combines the package and package body into one view with a procedure/function navigation tree and a list of errors in the package if there are any. 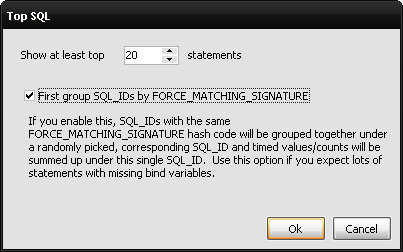 You can double-click on an entry in the navigation tree or in the error list to jump to the code position. Green icons are functions/procedures that are also defined in the package definition and thus can be called from outside the package. 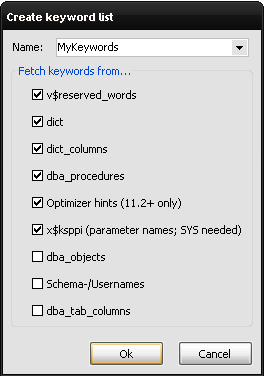 Keywords are currently from Oracle 11.2, but I plan to add a feature that lets you fetch the keywords from your database and link the generated keyword file to a connection set up in Mumbai. 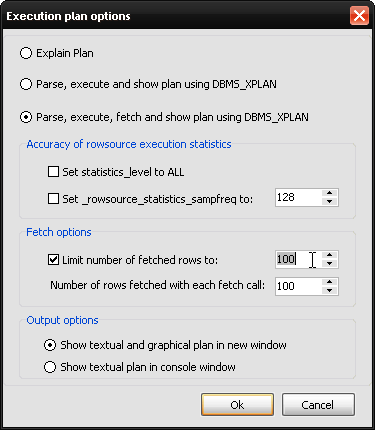 Execution plans are now shown with additional columns as seen in Randolf Geist’s brilliant xplan_extended_display_cursor script (http://oracle-randolf.blogspot.com/2011/12/extended-displaycursor-with-rowsource.html) – Kudos and big thanks to Randolf! I am not able to open and download the latest software Mumbai_v1.1.1.117.zip. I think the host where it is hosted is not reachable from various servers. I am getting 404 error. Can you please upload somewhere else and share the link? I am having problems download, i can’t get to download link, can you please check? I’m working on it. Might take a few days. Such a great tool ! I am amazed at seeing what you did in Mumbai. 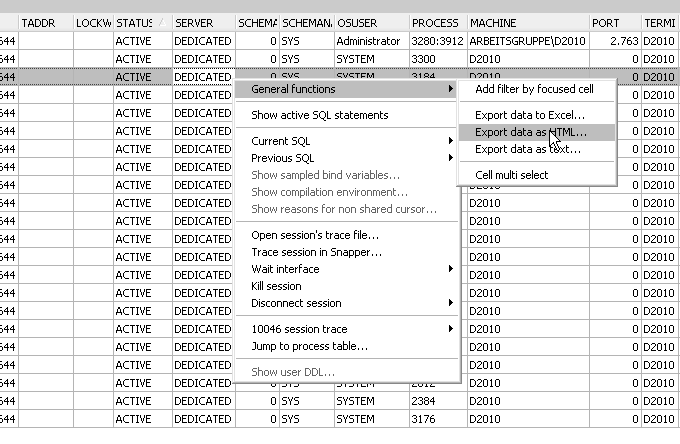 Recently I was searching information about the Oracle Wait Interface and I found the snapper script which then led me to your website. 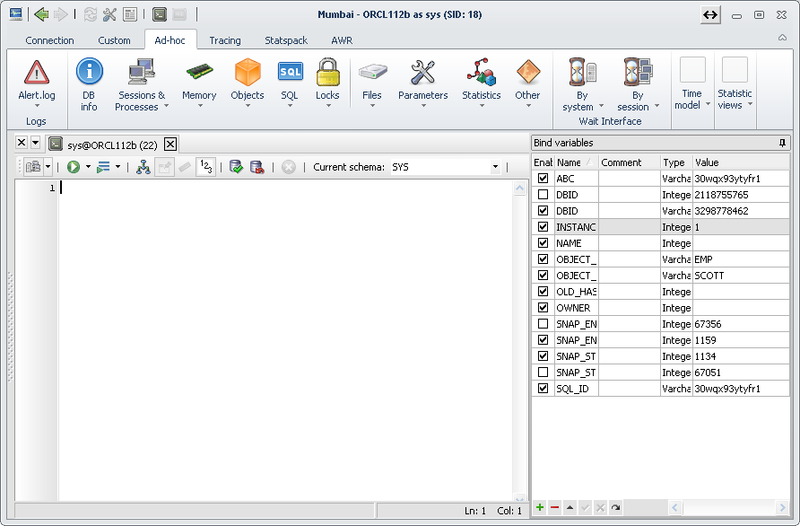 Congratulations for such an easyness of use, for the nice GUI, for the way snapper has been included and its data now available in graphic form. A friend of mine asked me if Mumbai exists for Linux. Good to hear you like it. Sorry, Mumbai is not available for Linux. I am wondering about the name. Mumbai is a famous city in INDIA. What made you to choose this name. There’s really no special reason behind it… I just liked the name of the city and city names for computer applications prevent trademark problems. This will only work if you entered a hostname on the “Easy Connect” page for this connection, even if you actually use a TNS alias. 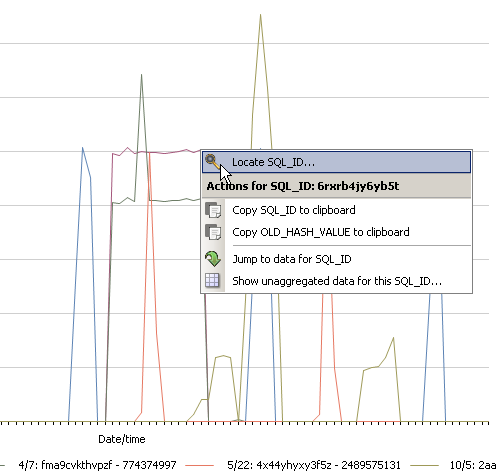 ORA-00933: SQL command not properly ended. 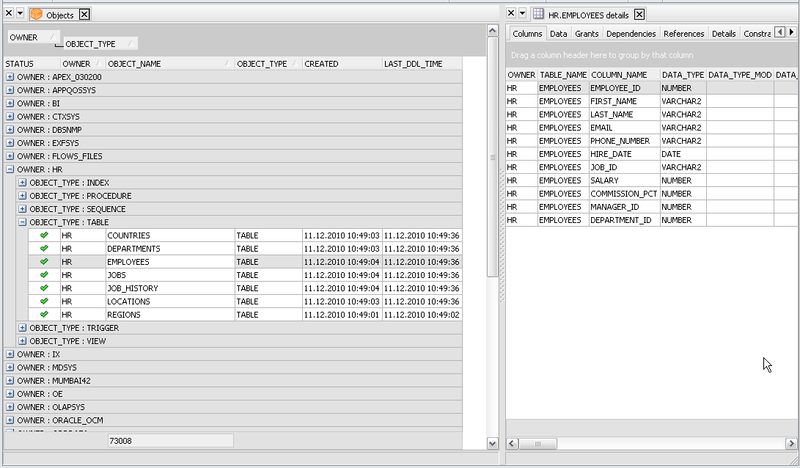 Everything works fine if I grant privileges on DBA_OBJECTS to my user or use an acount with dba privileges. Finally many thanks for sharing your work. Thanks for letting me know. I’ll take a look at it. Fabulous tool. Very elegant design and very very useful. Thank you for this. I was working on Snapper and got redirected from Tanel’s blog. This is a great tool. Congrats and Thank you!. Marcus, Awesome changes to version 2.1.1.630. I was already able to identify a problem that i am trying to figure out for couple of day with the help of correlation. AWESOME….. Thanks Amy! Good to hear it’s useful for you! I love this product. Can we expect a Linux version sometimes in the future? This is a Delphi compiled product and my main desktop is Linux X86-64. Having this on Linux would be a great plus. Good to hear you like it! There won’t be a Linux version though – sorry. Sieht ja klasse aus auf den ersten Blick, vielen Dank ! Just found out you added ASH info …. great stuff man. I needed to write BASH before I added ASH support to Mumbai, since I’m on SE… Good to hear you like the outcome! This application realy useful. 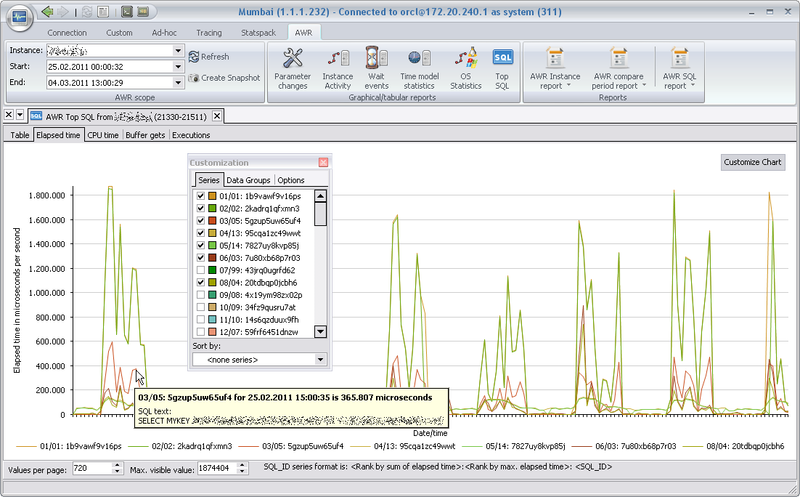 I liked how you integrated snapper from Tanel Poder with graphical part, AWR reports, Statspack reports and ASH. Well done! Keep on improve the program! 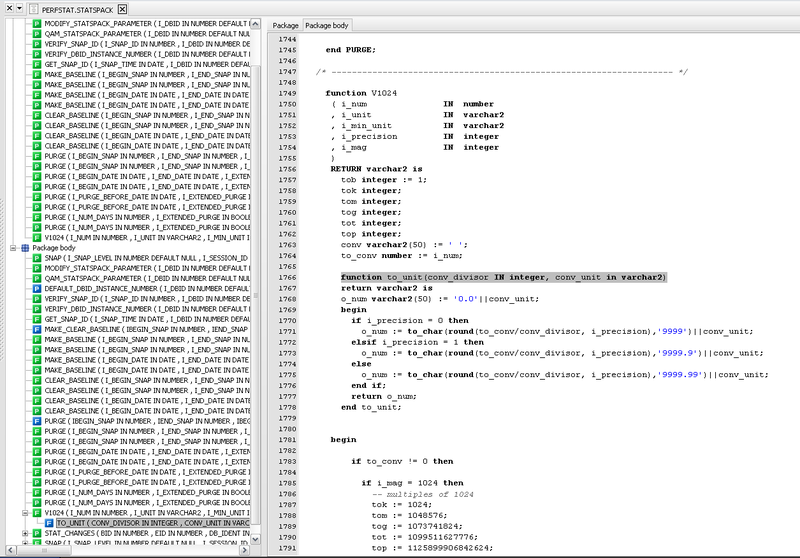 I see that program always hangs when I press ‘Refresh’ button in AWR section. Thanks Igor! I’ve fixed the AWR/SP refresh problem for the next release. Awesome tool … and I have not even enabled BASH on the server! I checked the statspack wait event graph and found that it would be cool if the x-axis labels (date and time) could be drawn with vertical orientation. 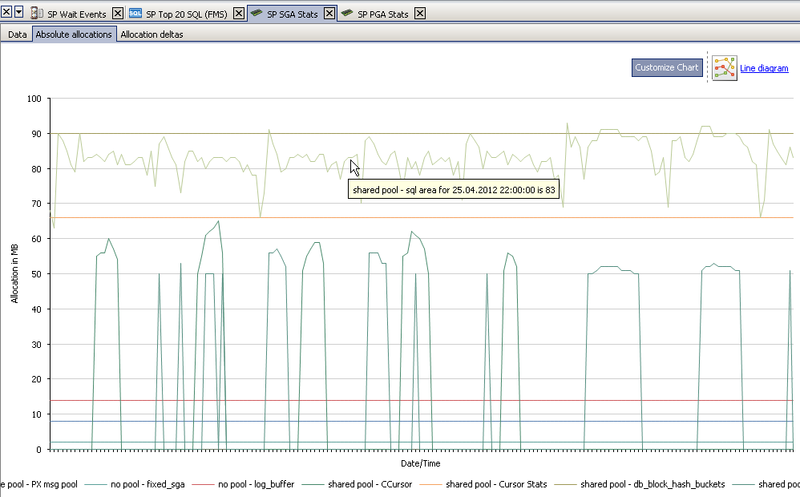 As it is now you cannot really see any of those labels if you make this graph for a week or so with hourly snapshots. good to hear you like it. 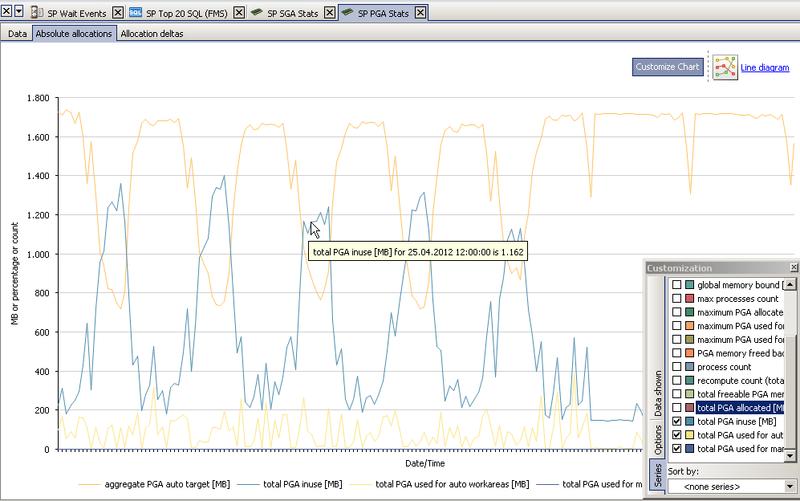 The labels on the graph are really a limitation of the charting component I use. For now, you will have to help yourself with the tooltip hints over the data series showing the date and time. I now use another charting component, e.g. for the ASH Viewer and I’ll probably recode the SP/AWR stuff for this new charting component sometime. Thanks for your comments … another thing you may improve with the SP graphing is to allow to draw the total wait times (per hour). For whatever reason you decided to take the unit ‘absolute wait time in microseconds per seconds elapsed’, its hard to map the resulting numbers to what really happens. I think the total wait times would be much more intuitive. The optical outcome would be perfectly the same, except that the numbers are more easily to understand. 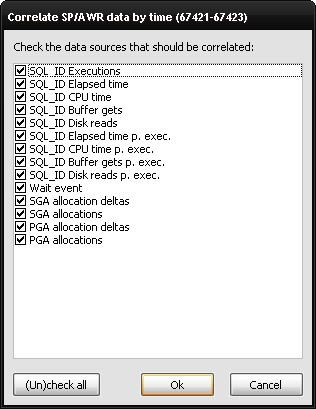 Example: SP report states 483 secs DB time and 194 seconds wait time for db file seq. read. Your graph says, its 53.855 microseconds at the same point in time. In my head this maps to 0,053 % which is really not much. But why is it graphed as such a dominant wait event? Because this wait time is 40,1 % of the total db time and so this is a major wait. Hope this helps. Following your example: 194 seconds wait time for db file seq. read in a one-hour (3600secs) interval means that 5,3% (not 0,053%) of the one hour wall-clock time were on this event. “53.855 microseconds per second” is just another way of saying this (1.000.000 msecs=1 sec). The reason for the normalized unit is that you can’t assume a uniform snapshot interval. There might be additional manual snapshots or times where you did e.g. 30 minutes snapshots. To show reasonable and comparable values the shown values are normalized to one second wall clock time and thus independent from the snapshot interval. 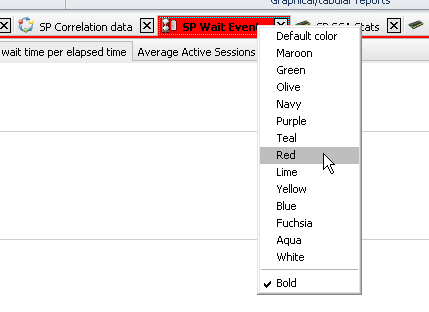 The SP/AWR textual reports work on one start and one end snapshot and have the duration of the interval at the top (actually they only have the timestamps and the first thing I always do is to write down the number of seconds elapsed), so you can put the absolute values below into context. The graphs in Mumbai work over lots of snapshots and thus need to normalize the values. Regarding the question if this is a major wait event: If you have 10 seconds DB time within a one-hour-interval and 90% of these 10 seconds were on “DB File seq. read”, would this be a major wait event. It is a large share relatively to the DB Time, but would you be interested performance-wise in an event that took 9 seconds in a 3600secs interval (0,25%)? It probably depends on how the 10 seconds were spread over different sessions and different times, but I guess the short answer would be no. 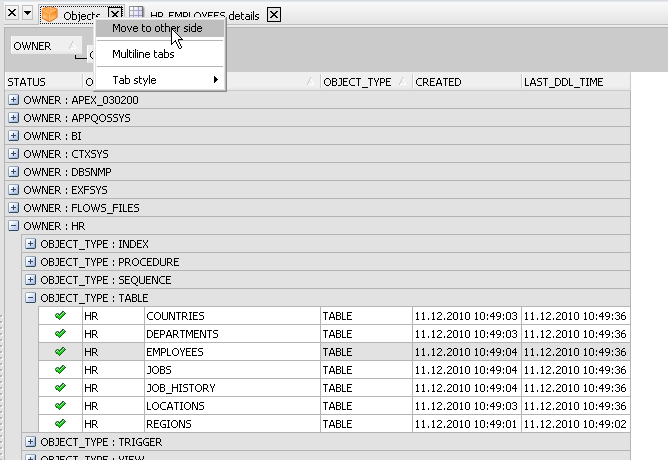 Is it possible to import AWR report from other database into Mumbai for analysis? I’m not sure what you have in mind. 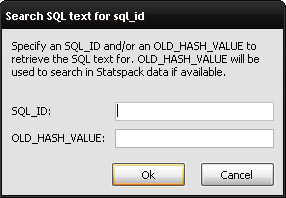 What do you mean by “other database”? Mumbai needs to fetch the AWR data from the database where the AWR data is stored into memory and will show the analysis result. Mumbai does not store this data persistently/locally. Hey, you are a God!. Very Amazing tool my friend.